Before Hsu, celebs including Australian beauty queen turned model Jennifer Hawkins, Taiwanese variety host Patty Hou and others have also chosen to say “I do” on this beautiful island that is already a wedding hotspot for many famous personalities. For those who wish to wed in style like the above mentioned, here is W&T’s pick on the best spots in Bali. Needless to say, we were won over by the resort’s most iconic wedding venue – the Infinity, a stunning glass chapel built just two metres above sea level. 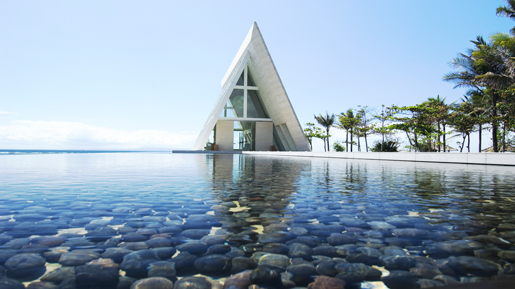 With the shimmering Indian Ocean as its backdrop, this triangular minimalist designed structure is a beauty to look at and undeniably, a most romantic venue to get married. There are also other wedding venues in this resort, located on Jalan Pratama Raya in Tanjung Benoa, north of Nusa Dua Beach, like the Water Garden and the Beach Bale. Both have Balinese-styled pavilions capable of accommodating around 400 guests. Taiwanese news broadcaster turned variety host Patty Hou held her wedding in this idyllic mountain villa in 2011, hence drawing our attention to this remote resort which is a beautiful meld of the old and new. Notwithstanding the breathtaking view for being located on a cliff top fronting south west Bali, the villa’s charm lies in its well-kept antique wooden villas that were once the homes of Bali’s noble men. Have a stay in these hundred-year-old houses to immerse in authentic Balinese history. Bali not only offers idyllic beach weddings, but also lush greenery and mountain settings in Ubud, also known as the cultural and arts centre of the island. In Hanging Gardens, one can opt to oversee an amazing view of treetops or the river valley for a more dramatic wedding experience.